Outside London behind a stone wall stands Lake House, a private asylum for genteel women of a delicate nature. In the winter of 1859, recently-married Anna Palmer becomes its newest arrival, tricked by her husband into leaving home, incarcerated against her will and declared hysterical and unhinged. With no doubts as to her sanity, Anna is convinced that she will be released as soon as she can tell her story. But Anna learns that liberty will not come easily. The longer she remains at Lake House, the more she realises that — like the ethereal bridge over the asylum’s lake — nothing is as it appears. She begins to experience strange visions and memories that may lead her to the truth about her past, herself, and to freedom – or lead her so far into the recesses of her mind that she may never escape… Set in Victorian England, as superstitions collide with a new psychological understanding, this elegant, emotionally suspenseful debut novel is a tale of self-discovery, secrets, and a search for the truth in a world where the line between madness and sanity seems perilously fine. A haunting look at women's asylums in 1850s England...Wallace masterfully creates an atmosphere of utter claustrophobia and dread. Soft, intricate and languid with a twist in the tale. This is a mesmerizing first novel. 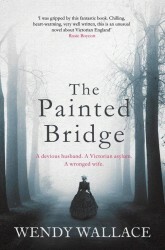 An emotionally charged gothic tale that will appeal to fans of the Victorian novels of Sarah Waters. A decidedly Dickensian flavor infuses the novel, both in style and in emphasis on Victorian social issues, and its lively cast of supporting characters includes caricatures of evil as well as painfully nuanced portrayals of moral complexity…quite delicious.